Anyone seen similar error? I cant find any info on this error anywhere. As I posted here, this appsecret_proof thing was added to the latest version of PHP SDK quite recently. So my guess is that your App Setting for appsecret_proof is enabled, but you are not using the latest version of PHP SDK so the appcesret_proof is not generated. You might want to check your setting at App Dashboard > Setting > Advanced > Security. Now they have [official document]. I got similar error to you. And I don't know how too. 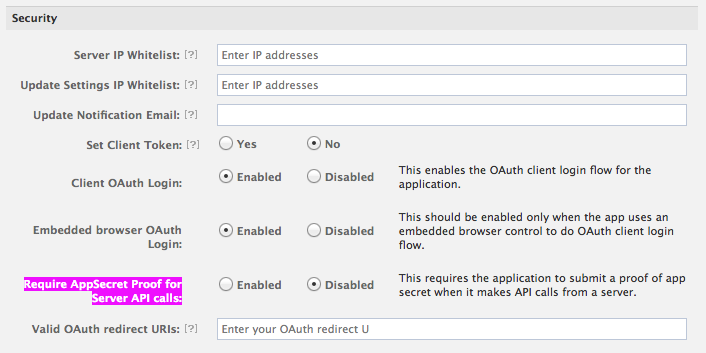 But if you don't really need OAuth login. You can disable it in setting>advance. No documentation about AppSecret Proof for Server API calls? Facebook API - Get Comment with php sdk error? $facebook->api() call returns CurlException: 7?